Use the MERLOT discussion forum connected to the mobile app to write a comment about how you are using the mobile app. 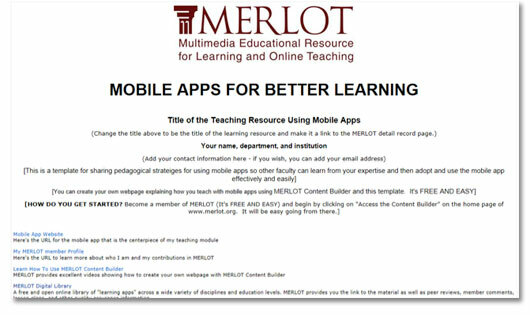 Use MERLOT's online Learning Exercise form to share the goals, learning outcomes, teaching strategies, assessment rubrics, and more about how you are using the mobile app. Just type in your text and publish it in MERLOT. 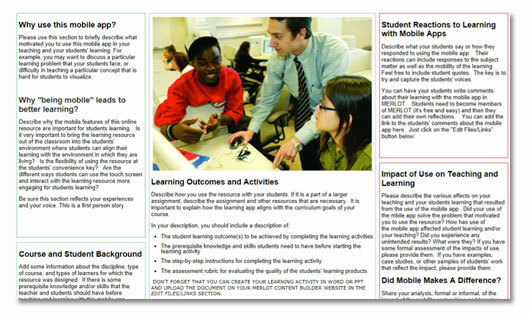 Use MERLOT's Content Builder template to create a rich teaching eportofolio explaining why and how you are using the mobile app to achieve student learning outcomes and include students' reactions and success. Want to Learn More About Using MERLOT to Support Your Mobile Learning Initiative? Here’s a brief Mobile Learning guide that outlines the many service and uses of MERLOT that can make your mobile learning initiative more successful.